Becici is a small resort town in Montenegro with a selection of good quality hotels. It is located south-east of Budva, and has 771 permanent residents (2003 census). There are wide variety of watersport- and other sporting facilities in Becici. The exceptional beauty of the long, sandy beach in Becici, Montenegro earned it honors as one of the finest beaches in Europe (Grand Prix, Paris) in 1935. Free oline map of Bechichi (Becici) city with streets will help you to plan a trip to Bechichi (Becici). Also it will help you find hotel, apartment, lodge, villa, cotage and house or accommodation of your choice in Bechichi (Becici). Becici town mostly consists of medium and large hotels. Some of them, such as the Mediteran, Iberostar Bellevue and Queen of Montenegro have been extensively refurbished, while the most significant greenfield addition was the Hotel Splendid, a luxurious five-star resort that cost 70 million euros to build. Free oline map of Bechichi (Becici) (hotels) city with streets will help you to plan a trip to Bechichi (Becici) (hotels). Also it will help you find hotel, apartment, lodge, villa, cotage and house or accommodation of your choice in Bechichi (Becici) (hotels). Budva is the capital of Montenegrin tourism. Budva is the metropolis of Montenegrin tourism thanks to the great number of beaches that make this a most desirable tourist destination. Near Budva there are exclusive resorts such as town-hotel Sveti Stefan and Milocer. Free oline map of Budva city with streets will help you to plan a trip to Budva. Also it will help you find hotel, apartment, lodge, villa, cotage and house or accommodation of your choice in Budva. 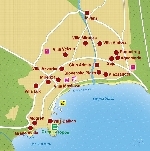 Budva hotels map (Plan of Budva hotels). Near Budva there are exclusive resorts such as town-hotel Sveti Stefan and Milocer. The Budva coast is 21 km long with 17 beaches. It is among the most beautiful coasts in the world and its beauty will not leave you indifferent. Free oline map of Budva (hotels) city with streets will help you to plan a trip to Budva (hotels). Also it will help you find hotel, apartment, lodge, villa, cotage and house or accommodation of your choice in Budva (hotels). Herceg Novi is one of the major Montenegrin tourist destination.The most famous tourist attractions in Herceg Novi are castle Forte Mare, a clock tower, the Serbian church St. Michael Archangel in central Belavista Square. Whilst the city itself is not a major destination for sunbathing, with no long sandy beaches, but many beaches are reachable by boat. Free oline map of Herceg Novi city with streets will help you to plan a trip to Herceg Novi. Also it will help you find hotel, apartment, lodge, villa, cotage and house or accommodation of your choice in Herceg Novi. The heart of Herceg Novi is the old town, with structures that were built in the various epochs in history. The clock tower (1667), Kanli-kula (1483), Spanjola Fortress (1538) and the Forte Mare Fortress (1687), represent just one part of the cultural heritage of this town. Free oline map of Herceg Novi (old town) city with streets will help you to plan a trip to Herceg Novi (old town). Also it will help you find hotel, apartment, lodge, villa, cotage and house or accommodation of your choice in Herceg Novi (old town).